In December of 2006, Brooks de Wetter-Smith travelled with Lindblad Expeditions/National Geographic to the Antarctic on a photographic and ecological study expedition. The trip combined his passion for photography and music and culminated in two new multimedia works. The first, Southern Ice, which premiered in June of 2007, includes his Antarctic images, narration and flute improvisation. The second, Iceblink, premiered April 27th, 2008 at the North Carolina Museum of Natural Sciences in Raleigh to a sold-out audience, combines Brooks' images projected in Blu-ray High Definition with an original composition by colleague and composer Allen Anderson. The music is scored for flute, clarinet, violin, viola, cello, string bass, harp, marimba, xylophone, vibraphone, singer and narrator. Southern Ice and Iceblink were sponsored by the University of North Carolina, the North Carolina Museum of Natural Sciences, Lindblad Expeditions/National Geographic, Raleigh Chamber Music Guild, with additional support from Canon, USA and Southeastern Camera. July 2009, Brooks traveled on the National Geographic Explorer to Svalbard, an archipelago in the high Arctic, as part of a new multimedia polar project. The result of this expedition was Ice Counterpoint, combining his photography and videography with arctic paintings by Nerys Levy and newly-commissioned music by Terry Mizesko. For many years, I have been fascinated by ice, mountains, and the draw of locations that articulate a pristine, primordial, somewhat forbidding remoteness. The relative inaccessibility of Antarctica contains all of these characteristics. It provides a connection to life before human beings inhabited the earth. It is a land uninterested in time, and essentially unsympathetic to human efforts to penetrate its history and mystery. Where else can human beings stand and contemplate the view in all directions, considering the possibility that no human has ever traversed its ridges and valleys. It is, for me, a humbling encounter with the Creator of this globe, and a profound exposure to our microscopic position in its evolution. Everyone comes away from the Antarctic a changed person. It forces us to engage our more customary lives with a deeper reverence for the natural environment in which we play an undeniable role. The Arctic is as different from the Antarctic as two siblings in the same family. There are of course the similarities of ice and cold, but the differences become immediately apparent. Both polar regions enjoy a wide variety of wildlife, but the Arctic wildlife seems easier to encounter, and to the uninitiated eye is more readily vibrant. The region’s terrain assists this encounter. If Antarctica brings me closer to the history of this planet, the Arctic pulls me ever more steadily into a recognition of the impact of our lifestyles on these sensitive regions. As music contains both sound and silence, polar exploration emphasizes our symbiotic relationship with where we have been and where we are headed. It is the counterpoint of our legacy. Brooks' videography and a brief interview for Ice Counterpoint, are below. Brooks de Wetter-Smith’s lifelong dream of traveling to one of the most remote and exotic locations on earth was at last realized with his 2006 trip to Antarctica. Collaborating with composer, Allen Anderson, the two worked together, assembling the composer's work with stunning images photographed by de Wetter-Smith and culminating in a breathtaking artistic work. The photography, so artistically edited using digital technology, was so visually seductive, that I immediately wished I had the opportunity for a second listening. 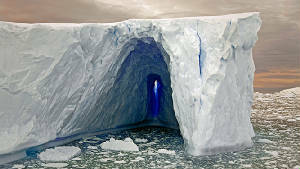 The multi-media program Iceblink should travel across the United States in an effort to inform through sight and sound and, as the creators say, "put a face" on Antarctica. Brooks de Wetter-Smith's Southern Ice brought to life the sights and sounds of Antarctica in a way that deeply moved our audiences. From the moment he began playing his flute in the darkened hall, to his personal readings about the beauty of Antarctica and its vital role in the survival of our planet, to his stunning images and recordings of breaking ice and soaring birds, our audience was mesmerized." "It was a magical experience!" "Ice Counterpoint was a lavish and spectacular debut.... It's at once beautiful and bleak, and the music enhances the images in all the right ways....Some of the wildlife are so charming one wishes to reach out and touch them -- but in the end there is no relief from the prevailing message that we have done terrible things to our world; the sight of those [polar] bears picking their way across ever-smaller bits of broken ice proves, ultimately, overwhelming.... The emotional impact of the music and the videos in combination worked unusually strong magic.... There was a substantial ovation, thoroughly deserved." "[Ice Counterpoint preview] is the most beautiful piece I have ever seen concerning ice and I am so moved. Congratulations on a gorgeous work that will endure and inspire. You are a gift to my time on the planet." CLICK HERE FOR VIDEO PREVIEW OF ICE COUNTERPOINT. Both Southern Ice and Iceblink tour at venues across the country. For information about booking, please contact Brooks de Wetter-Smith at dewettersmith@gmail.com.